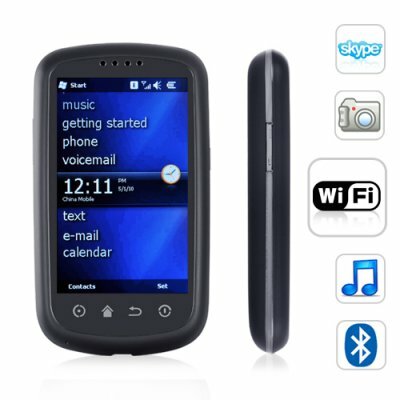 Successfully Added El Portal 3.2 Inch Touchscreen Windows Mobile Smartphone + WiFi to your Shopping Cart. The El Portable has been upgraded! It now houses the powerful Windows Mobile 6.5 software. This professional cell phone comes with a powerful (802.11 b/g) wireless receiver and built-in G-sensor for auto landscape and portrait rotate. With simple email and windows Shell applications setup, this wonderful 3.2 inch touch screen smart phone is the perfect all-on-one communication and entertainment powerhouse. El Portal is constructed with top-grade materials to make it durable and yet light weight for a more comfortable on the go PDA cellphone. The Windows mobile 6.5 professional runs on a Marvell PXA 310 624MHz processor, 256 MB internal flash memory along with the capability to expand your storage capacity using a micro SD card of up to 8GB in memory. This Smart PDA will not only keep you connected, it will give you a truly mobile office which is available anytime, anywhere. This slim portable PDA smart phone gives you complete flexibility with an impressive feature set. Stay connected with Bluetooth and WiFi connectivity, use PC synchronization to keep up to date with your busy schedule, use MSN Messenger when you have WiFi access on your mobile phone, and even synchronize your MSN Live account with your email software through Hotmail, and setup POP3 email within seconds. El Portal is the perfect global use worldphone for business people on the go, and comes packaged with the office software Excel, Word and PowerPoint. You can even download and use a wide range of additional software applications on the net to expand the mobile phones flexibility, such as the Apb Shell for Windows Mobile. El Portal's 3.2" touchscreen is clear, sharp and sturdy and displays a wonderful user friendly menu which can be controlled very easily by the touch of a finger. This phone also learns what you like, putting your most frequently used functions at the top of the list. Finding your way round web pages is also easy with the Internet Explorer's zoom function which lets you zoom in and out with the touch of a button. When you are not using the CVMB-M88 to make phone calls, send text messages, or surf the web, then you can even go ahead and install GPS software onto your new Windows Mobile PDA smart phone and use El Portal as a portable GPS navigator, thanks to its built-in GPS chipset. This outstanding top of the line Unlocked Windows Mobile 6.5 PDA smartphone is the very thing you need to help you organize your life when you are on the move. Now you will always have the most popular tools of an office computer right at your fingertips on a slim, sturdy cell phone. This sizzling hot new item is in stock now. So get one for personal/company, resale, online/physical store or your internet shop, straight from the leader in wholesale electronics, Chinavasion. NOTE: This mobile phone is compatible with GSM at the four frequencies of 850MHz, 900MHz, 1800MHz, 1900MHz. This can be used throughout the world. - Today - Date / Time, Wi-Fi/Bluetooth, Set Owner Information, messages, Tasks, Appointments, Live Search, Lock/Unlock Device. - Office Mobile - Excel, One Note Mobile, Power Point, Word Mobile. - Phone - Dial Number (Touch Screen Inputs), Menu - Open Speed Dial, Options- Ring Type, Ring Tone, Keypad, Security, Services, Network, Fix Dialing. View - Calls and Contacts, All Calls, Speed Dials. On screen key Pad. - Getting Started - Make a Call, Set Up Email, Set Time & Date, Setup a Device Password, Setup Bluetooth, Set Background, Set Ring Tone, Transfer Music, Add/Remove getting Started. - Settings System - About, Backlight, Certificates, Alarm & Clocks, Customer Feedback, Device Info, Encryption, Error Reporting, External GPS, Managed Programs, G-Sensor, IP Call, Master Clear, Memory, Power, Regional Settings, Remove Programs, Screen, Touch Key, Windows Update. Quick multimedia access to watch movies, listen to music and view photos. Our Second Windows Mobile smartphone offering! The CVMB-M88 Supports many additional features not listed here. Synchronize MSN with Outlook and receive emails from your Hotmail directly to the phone. To conserve battery life, always switch off wireless internet and Bluetooth unless needed. Go to setting and select power to adjust the phone to switch off if not in use for more than one minute, you will still be able to receive calls. This will save battery power. For quick note taking and organization use the organizer, included within is standard note taking that allows hand writing function, with full calendar, task, contacts management. The El Portal M88 allows users to download and install additional programs that are compatible with the devices OS. Please note that Chinavasion does not provide any customer support or technical support towards user software updates and user installed applications. Note: Any attempts to upgrade/flash/modify the default operating system (Windows Mobile 6.5) on this cell phone will void the warranty. As a wholesaler, Chinavasion provides no software support, advice, or training regarding the Windows Mobile operating system. on 2011-12-11 11:15:06 It's a great phone. Had no problems at all setting it up with a generic sim card i bought from Chinavasion and everything seems to be working as advertised on the webpage. Being a Microsoft operating system makes it so easy to update as well. Keep up the great products Chinavasion. Good going. I'd definately recommend this phone to anyone who is more at ease with windows operating systems than android ones. On the New Products page, it says "The El Portable has been upgraded! It now houses the powerful Windows Mobile 6.5 software" but when you click on it, the whole review says it uses *windows mobile 6.1*, which one is the correct ? My second question is, does it have 3G ? Congratulations Chinavasion for keeping your hardware updated! I'm looking forward to the new El Portal. [Chinavasion Editor: The El Portal has been updated to Windows 6.5, But it is not a 3G phone, The El Portal is a Quadband Smartphone]. Thank you for your review. very good item, a real smartphone ! thanks a lot ! I agree with everyone! A real smartphone! The best "phone" I've ever had! The phone : Delightful shape / hightech / intelligence / light and handy / real smartphone. The price : Reasonable / attractive / affordable ...... but of very high quality. Delivery : Unbelievable fast , less than 5 days to my hand (Canada). Order on Monday morning - and friday noon arrived. Difficult to portray in words for the rejoiced. Thanks so much Chinavasion, you did the great job.